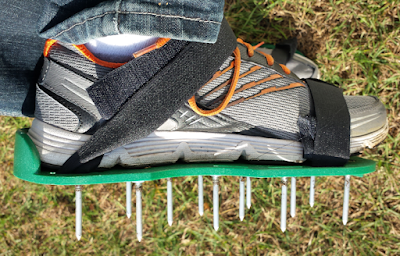 It's the last third of November here in Minnesota and there is usually a couple of inches of snow on the ground so why would I be reviewing these Lawn Aerator Spike Shoes by Dicani? While it isn't the ideal time for aerating your lawn, the ground is still soft enough to test these shoes and write a report about their functionality. The package arrived with the shoes unassembled which I would assume is to keep packing costs down, and to prevent potential injury to the mail carrier. The shoes are simple pretty simple to put together, there are 4 velcro straps, 2 of each length, the longer of which goes to the rear of the foot plate as the ankle strap. Just thread the straps through the slots in the base and that's it. The spikes need a little more work. 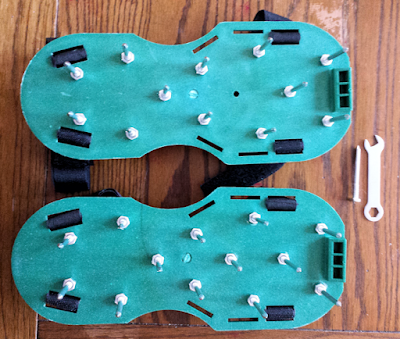 There are 13 holes in each footplate, each ready to house the 26 threaded spikes. Push a spike down through the top and the bolt end sits in a hexagonal recess to hold it steady.Secure the spike from the underside with one of the 25 nuts provided. The nuts can be tightened with the wrench like mini-tool that comes with the pack. Notice the math doesn't quite work out here? Just like Lance Armstrong, I was a nut short. I wasn't going to let this oversight dampen my day, so I carried on. I would recommend waiting until you are at the lawn before attaching these shoes, unless you are used to walking on 2 inch platforms, and even then, you could damage the spikes by walking on a non-lawn surface. There is plenty of velcro strap to go around, especially at the toe end. I had to tuck the end back under to avoid stepping on the extra 6 or so inches of strap. I would suggest trimming the strap to length once you have figured out how much excess you can afford to lose. These are a one size fits all attachment and as a guide, I am wearing size 10 tennis shoes in these pictures. The next trick was to learn how to walk in these things. 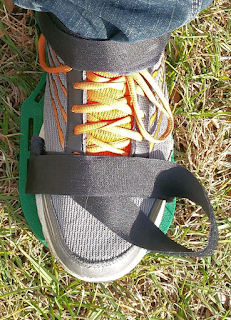 With a 2 inch spike on the bottom of your shoe, you have to modify your stride to lift your foot vertically, and I found that the best way to preambulate around the grass was to walk with a high knee lift, not unlike the way a small child marches. The spikes are sturdy and remained tight after a 10 minute test in a small area of grass. Sadly I will not be able to see any benefit to aerating my lawn with these spike shoes until the other side of Winter, when the grass begins to grow again. These spike shoes do perform as described, leaving a series of small holes in their wake which will, in the Spring, produce a healthier lawn. Watch out for our 6 month Re:VIEW, when I will be able to report back on how my lawn looks after using these shoes during the growing season. Overall, I like these spike shoes. They do what they are designed to, and attach and detach to my shoes easily. 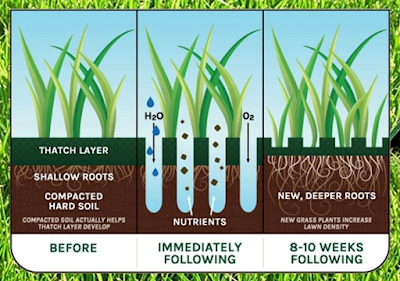 They are also much cheaper than buying or renting a machine to aerate your lawn. Just slip them on when you are mowing and before you know it, you have trimmed and aerated your lawn.